The successful trial of the modified Su-30MKI carrying the supersonic BrahMos-A cruise missile takes India a step closer to acquiring a devastating deep strike weapon. India has signalled its intent to strike enemy targets with devastating force early on in a conflict. 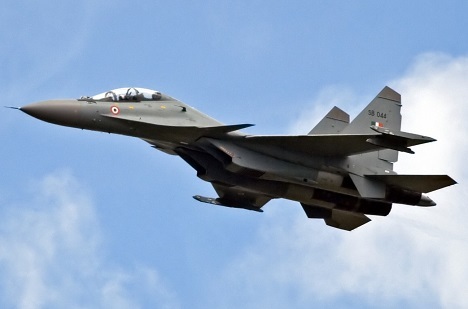 On June 25 a modified Indian Air Force Sukhoi Su-30MKI aircraft carried a Brahmos-A (Air) supersonic cruise missile aloft for the first time, marking an important milestone in the development of the missile ahead of further flights and firing tests. The twin-seat multirole fighter took off from the Hindustan Aeronautics Ltd airport in Bengaluru and conducted a 45 minute sortie with the missile attached to its underbelly. Developed jointly by India's Defence Research & Development Organisation and Russia’s NPO Mashinostroyeniya, Brahmos-A is a modified variant of its basic configuration. "It features several design refinements, which include a lighter propulsion system (reduced to 2,500 kg from 3,000 kg) as well as redesigned fins and nose cap," reports Janes Defence Weekly. Currently, India’s nuclear delivery system is based on land-based ballistic missiles such as the Agni and Prithvi plus the IAF’s nuclear-capable Mirage 2000, Su-30 MKI and Jaguar fighter-bombers. The final element of the nuclear triad, submarine-launched ballistic missile, is still being tested. The BrahMos’ maximum speed of 3700 km per hour speed – literally faster than a bullet – means it hits the target with a huge amount of kinetic energy. In tests, the BrahMos has often cut warships in half and reduced ground targets to smithereens. The Sukhoi’s blistering speed will add extra launch momentum to the missile, plus the aircraft’s ability to penetrate hardened air defences means there is a greater chance for the pilot to deliver the missile on to its designated targets. Against Pakistan, the targets are obvious. A two-squadron attack using most of the SFC’s air assets can within minutes utterly cripple the country’s command and control centres; nuclear power plants, including the Kahuta ‘Death Star’ where the majority of the “Islamic” bombs are manufactured; the Sargodha Central Ammunition Depot west of Lahore where these warheads are stored; ballistic missile bases in Gujranwala, Okara, Multan, Jhang and Dera Nawab Shah; Pakistani Army Corp headquarters in Rawalpindi; the Karachi Port, Pakistani’s only major harbour and its Naval HQ; and ordnance factories that manufacture tanks and fighter aircraft. The supersonic Brahmos armed with a conventional warhead can theoretically penetrate hardened command, control and communication centres. However, if required the missile’s conventional warhead can be replaced with miniaturised nukes. A pre-emptive nuclear strike will therefore ensure that Pakistan’s offensive capability is effectively neutralised and it is never again a threat to India. Having a dedicated aircraft for the nuclear attack role offers India’s war planners strategic flexibility and increases the odds of success. Because ballistic missiles are used only as a weapon of last resort, they cannot really be deployed at will. Once released, they cannot be recalled and if shot down are not easily replaced. Fighter aircraft, on the other hand, can perform repeated sorties and be directed to bomb targets as they move. For instance, if Pakistan moves it warheads out of Sargodha depot, which is presumably under constant watch by Indian satellites, the Sukhois can be vectored against a column of Pakistani trucks transporting their nuclear cargo. Because heavy modifications were necessary for integrating such a heavy missile onto the Su-30MKI, initially it seemed to make little sense to deploy a single missile. Aviation Week reports that initially even Sukhoi was reluctant to go along. That prompted HAL to go solo, but Aviation Week says Sukhoi eventually came on board, in 2011. The Russian side provided HAL with technical consultancy especially for the modifications to the fuselage in order to accommodate the 9-metre-long missile. “Work is also underway on a modified lighter and smaller-diameter version of the BrahMos for deployment on the Indian navy's MiG-29K and, potentially, the Dassault Rafale,” says Aviation Week.